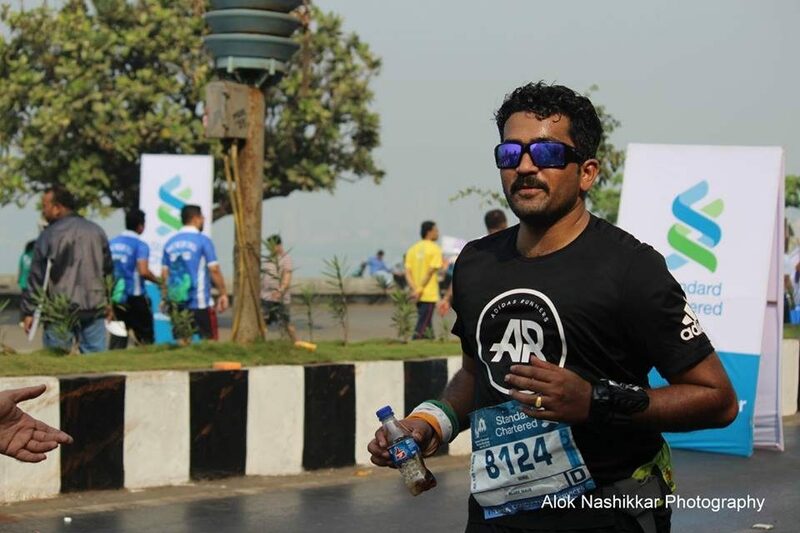 With all the euphoria and anxiety mounting for Mumbai Marathon, here is an light article to make you smile through the vigors of a tough full marathon route. Disclaimer : Any one who runs fast, please forgive me – because this piece is for slow runners who are about to go through Mumbai in its full glory. 6 kms : Close to Babulnath on left and Soam ( the best gujarathi food restaurant) on right. 7 kms : You begin your ascent towards the first flyover at Kemps Corner. You feel fresh. Elite runners are now nearby. Malabar hill on the left…. 9 kms: The descent on Peddar road. This is going to be tough when you come back at 35kms. Okay move down to Mahalaxmi and Haji Ali dargah on left…..piya haji Ali. Heera Panna on your right. Move on…..on the road…..the race course…..the Half Marathoners are on their way. 11 kms : Turn to the big festival on to Worli Seaface. The regular Mumbai Road Runners point…. Atria mall on right. Run and run till sea link at 16 km….the other side of road will be like khumb mela with half marathoners ( lots and lots of friends). Turn on to sea link (only time in the year when it is open to public), Remember – it’s one of the most beautiful things to happen to Mumbai (please don’t pee on this monument) . From 16 kms to 21 kms – Just enjoy. This is where the press photographers are and you may stand a chance of seeing yourself in the newspaper next day. 22 kms – You turn on to Bandra Mahim stretch. You can see lot of people cheering for you here. Slow runners like me get the first realization – half the distance over – and half more to go. 24 kms : You move on to Hinduja hospital on right. So far, you feel fine. Now the iconic Shivaji Park and the land of SPMC Runners. They will pamper you. You will now cross the Mayor’s bungalow, the chaitya bhoomi and the route of Mumbai ultra. This is where you feel the tornado effect. Some aliens just went past you. In simpler language they are the elite runners – the Kenyans, Ethiopians and Indians too. I bow down to the èèee!!!! 26 kms – This is where I say automatically – Ganpati Bappa Morya….. hey Siddhivinayaka. I pray the powers to give me and us all the strength to run the remaining 16. 28 kms – Move on to worli seaface from RTO lane. Ladies and Gentlemen this is where the toughest part of our Full Marathon heralds! Looping on Worli Seaface, you comeback, INS Trata on left, move on, lots of volunteers, you cramp…..the fight begins…..
34 kms – You are near race course and about to meet Lata Didi at Peddar Road. She is waiting with the song “yeh mere watan ke logo yaad karo qurbaani” and here we are not able to run…..
35 kms – Welcome to Peddar Road Residents Association. Hats off to these guys. They pamper you with every thing minus beer. And then – Peddar Road is over God…..
36 kms – Turn on to Babulnath and on to Marine Drive…..the King’s bracelet begins. Now…..hallucinations begin….your feet move, your mind stops, you even fail to notice a girls hostel on left near Wilson. 40kms – Near erstwhile Jazz by the Bay you turn towards last 2 kms. That’s were Nana Chudasama with his banner shines – the last leg. While the whole world here is together to cheer you up, make you stronger, you are down and cursing yourself for registering for this full marathon! My favorite line goes through my mind “I run therefore I am”. Wonder what the cop standing there since 3 am is thinking? Dude – you run therefore I am standing here???? 41 kms – God am there…..
600 mtrs to go…..my beer…. 400 mtrs to go…..my friends waiting…. On to the most iconic building on right…..the Statue of Victoria smiling at you…. 200 mtrs to go – The clock shows 5.26…. Last few steps – The clock shows 5.28….. Finish line – My eyes go wet, my chest swells, my shoulders drop, suddenly the cramping legs give way…..to the stronger legs….. CROSSED – 5.28.04…..totally rogered, beaten up in every part and muscle of the body, I tell myself – I will come back again next year. I have earned this medal and this metal and I can do it again! And such is life – there is no way I can define the pleasure in this pain. It is for the human mind and human body to experience. Words will fail. No matter how many times you do it. My runner friends – See you There, See you Running There! Bijay Nair, LtCdr (retd) 42 yrs is an ex decorated Indian Naval Officer from the Engineering cadre; Avid Marathoner running for the last 12 years; blogger; motivational speaker. He is author of one of the best seller in Running and Motivational Genre - #TheyInspire. Married and settled in Mumbai, he is dad to a beautiful 12 year old. His genre is Humor and writes as per instinct. His subject is mostly situational. Has Run 14 Full Marathons ; 100 plus Half Marathons and 10 kms runs.He is a blogger and write humor satires. He also keeps a day time job as Associate Vice President in National Shipping Classification Society.In short - a true runner who makes a great writer, with amazing endurance.